Constitutionally a part of Denmark, the Faroes have the full legislative and executive power over fiscal regime, postal service, education and banknoting. The crown in Copenhagen supplies them with other social and economical services such as health, the army and infrastructures. Although not an independent State, the Faroes achieved the right to trade freely in 1856. They have their own Parliament and Government and enjoy autonomous control over internal affairs since 1948. Also the Faroes keep aside from international and economical politics as they are not members to the E.U. The link with Europe is provided by private operator Smyril Line, which deploys its sole unit - the ferry "Norrona" - in the service connceting Scandinavia and Iceland. 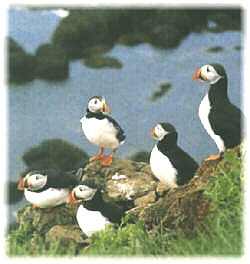 With their inaccessible to humans cliffs the eighteen islands are a natural paradise for billions of birds. Among the most popular of them is for sure the 'smyril' (merlin), a small bird of prey. No surprise than this bird is represented in the funnel of "Norrona" and in the name of the ferry operator. The name of the ship means in faroese Northern Countries to underline the multinational importance of this maritime service for a number of different States. Apart from the headquarter in Torshavn, capital of the Faroes, the company has its offices also in Norway and Iceland. 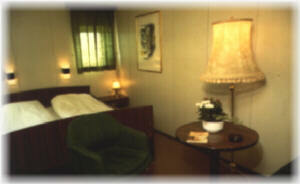 In Denmark and in the UK respectively the companies DFDS and P&O play as Smyril Line agents. The "Norrona" makes a triangulation connecting three countries and pivoting over the Faroes. Every Saturday evening the ship leaves from Esbjerg (Denmark), call in Torshavn on Monday and go to Bergen (Norway). On Tuesday morning she leaves Norway passing through Torshavn and arriving to Seydisfiordur (Iceland) on Thursday. From here she reaches again Torshavn on Friday and go back to Esbjerg where it arrives on Saturday morning. The service is for summer period only from early June to late September. Peak seasons is during July and August especially thanks to the tourist flows to Iceland. These people come mostly from Germany and Denmark, even though a growing presence of people from the Southern European countries is recorded. During winter the "Norrona" is chartered to companies operating in the North Sea. Smyril Line strategically obliges passengers to spend some nights in the Faroes, by such acting as a real market maker for the small country tourist industry. Actually, after the decline of fishing and cattle-breeding, tourism has become the most important source of income for the 46,000 inhabitants. n such a poor economy "Norrona" is very popular among people, so that for instance on the walls of the master's room on board her there are the notes and lyrics of 'Norronu Valsurin', the song dedicated by a folk group travelling with "Norrona" each summer. 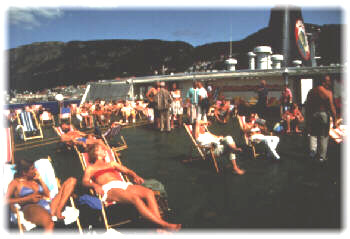 The crew is 90 per cent formed by nationals, and 46 of them are also among the more than 2,000 Faroese who are shareholders to the Smyril Line. Established in 1983, the shipping company bought the then 10 years old "Norrona" from Swedish interests and modernised her in Germany. 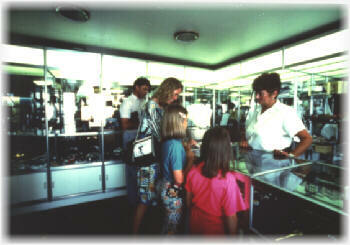 From its beginning the company has put great emphasis on travel organization. Today a wide range of packages is offered to individuals and group travellers. Smyril Line also owns the youth hostel in Torshavn and has commercial agreements with other ferry operators in the North Atlantic such as Color Line and P&O Scottish Ferries.